Could Truck Safety Cages Increase Throughput At Your Facility? Increasing throughput is critical to your production facility’s bottom line. Although you do your best to educate your employees and meet workplace safety standards, production workers occasionally cut corners to save time and expedite the production process. Workplace accidents create a substantial financial burden, and accidents that result in serious injuries or death often cause production delays and may take your facility out of commission. Your business can’t afford the consequences of a workplace accident, which is why it’s so important to invest in fall prevention solutions and improve truck safety. Truck safety cages are about more than simply meeting safety standards. They help your business’s bottom line by eliminating the need for complex harness systems, improving efficiency, increasing throughput and maximizing revenue. When a truck is spotted correctly, safety cages help to protect your workers from dangerous falls and injuries. Accessing the top of a tank truck is a dangerous task, regardless of whether you’re at your production facility or on the road. In many cases, accidents occur due to a lack of knowledge about proper safety protocols or the lack of proper safety equipment. Here are two types of accidents that may be prevented by using safety cages. Most of the time, accessing the tank means your employee has to climb on top to open the hatch. Without the proper equipment, standing on top of a truck puts your workers at risk for serious injury or death from a fall. 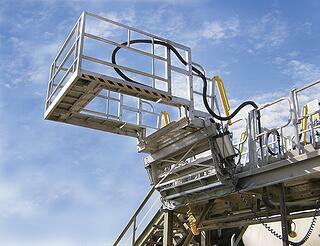 Preventing falls requires a properly designed truck safety cage or other enclosure solution. Even if an employee loses balance or trips while on the tank, the cage can keep them from falling to the ground or experiencing secondary hits. In 2011, a driver was delivering cleaning agents to a retail store. Upon arrival, he parked the truck and climbed the side rail to access the top to verify the seals. While climbing down, he fell approximately 11 feet and died from his injuries. Although OSHA never determined the exact reason he fell, it’s evident that even with a ladder, climbing up the side of a tank truck can be dangerous. In this situation, a fall prevention solution such as a portable tank truck access system may have prevented the accident from occurring. Having a safety cage doesn’t mean you’re in the clear, but it does decrease the chances of someone falling from a tank truck. If you fall without a cage, you land wherever gravity takes you. With a cage, you’re likely to fall within the confines of the cage, limiting the chances of injury. Fall prevention solutions increase throughput by reducing the number of interruptions in the workplace. When fewer accidents take place, your workers are more productive and efficient, increasing the production speed at your facility. As you review your options for safety equipment, think about accessibility and ease of use for your workers. Equipment that’s difficult to use reduces efficiency and slows down production speed. Also, it’s essential to educate your employees on workplace safety, fall prevention and proper use of all safety equipment. Ready to learn more about improving truck safety at your production facility? Download our free e-book to learn more about creating a safer, more efficient workplace.